Ok, it’s really hot today, and I’m sure my tomatoes will ripen and ripen through October, but I’m feeling like it’s time to look back at the summer garden and take note of successes and failures in the tomato patch. This is my favorite cherry tomato and I plant it every year. It’s an F1 hybrid but what a delicious pineapple-y treat. It must be a complicated cross because no one to date has stabilized this one. I practiced restraint and only planted one. Thank god, I’m still behind picking this orange cherry tomato, which grew to 7 feet tall. Every day I can pick a basket of them, and feel like I got away with something when I see them for sale at grocery stores for $6 a basket. When I’m not eating them fresh, I roast them in the oven with olive oil, then freeze this concoction in jars for the long Oakland winter (snicker snicker). Also dehydrated some and they taste like sour/sweet raisins. Yum. A delicious black tomato, named after activist and actor Robeson. The taste of this kinda big but not quite beefsteak is incredible: meaty, rich, sweet. But the texture is just too soft. They are crushed by even a sharp knife. Very low yields this year–I think I’ll skip next year. Anyone have a fav black slicer to recommend? These are just starting to ripen. I bought them as plants from a lady at the farmers market, and some of them are large and meaty but one plant is making tiny little mealy fruit. I really need to get some seeds from Vincenzo, Rosetta Constantino’s father. Every year he saves seeds from his San Marzanos brought from seed from Calabria in the 1970s. So good when split in half, drizzled with olive oil and some thyme, and roasted in a slow oven. God. In 2005 Monsanto, the agro-company that makes Round-up, bought Seminis, a seed company that was the breeder of a beloved tomato called Early Girl. In California, Early Girls were “dry-farmed”, which produced an amazing flavor bomb that I loved to can away for the winter. But many farmers don’t want to buy anything from Monsanto. So, Joe Schirmer, of Dirty Girl Farm in Santa Cruz spent the last 5 years stablizing the hybrid. And now: I present The Dirty Girl. I planted four of these and four of the Early Girl. The Early Girl is the bigger one on the left. 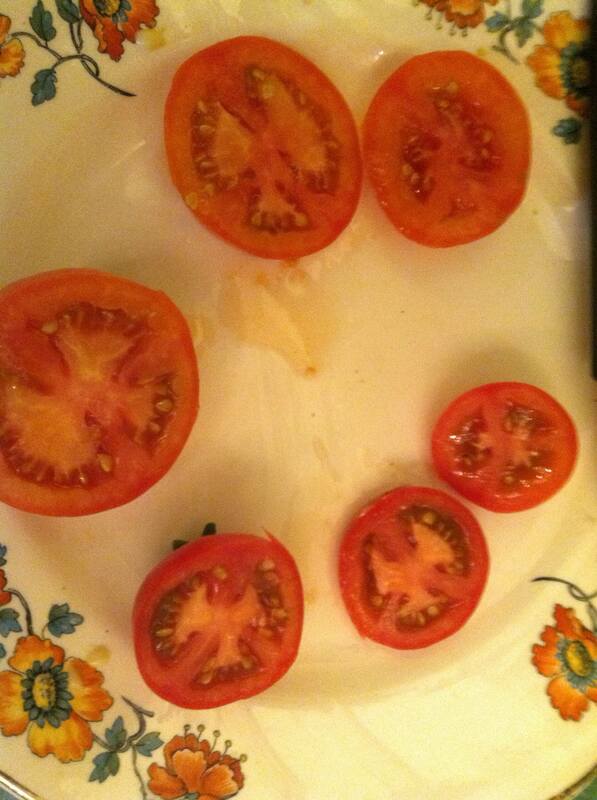 And no, I swear those aren’t rolling papers next to the plate of tomato. 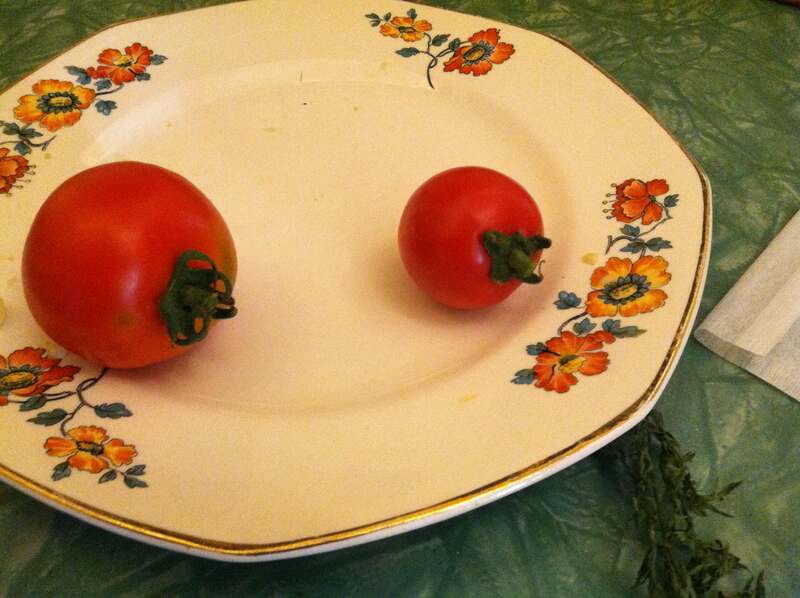 Besides a size difference, the tomatoes looked exactly the same, inside and out. As for the taste? Dirty Girls were just as rich, just as concentrated in flavor as the Early Girls. Which means that next year, it’ll be Dirty Girls all around! Go Joe; and thank you. And what do I do with all these ‘maters? Planning to can some but right now fresh eating is all I can do. Had an amazing snack with them the other day: the tomato tops were cut off and sprinkled with salt, pepper, and bits of basil, then a Lebanese anise flavored alcohol, Arak, was poured over said tomatoes. Left to marinate for 30 minutes and then slurped up. The best new thing I’ve tried in awhile, especially on a hot day. More Lebanese canning stories soon. Stay cool….